Sleepless, exhausted parents will do just about anything to get a few more hours (or maybe even a few more minutes!) of sleep each night. And as followers of this site know, there’s no shortage of advice out there on how to do just this. Everyone from your grandmother to your next door neighbor has probably offered you advice that’s “guaranteed” to get your baby sleeping well. Here’s a piece of advice many tired parents have heard at some point: “Just start feeding him rice cereal, and he’ll sleep all night long!” Sound familiar? I’m betting it does. So is there any truth to this? Can starting solids really help your baby sleep longer and better? Let’s investigate. Will Starting Solids Help Baby Sleep? Short answer: probably not. There’s no evidence that starting solids helps a baby sleep any better than she did before. 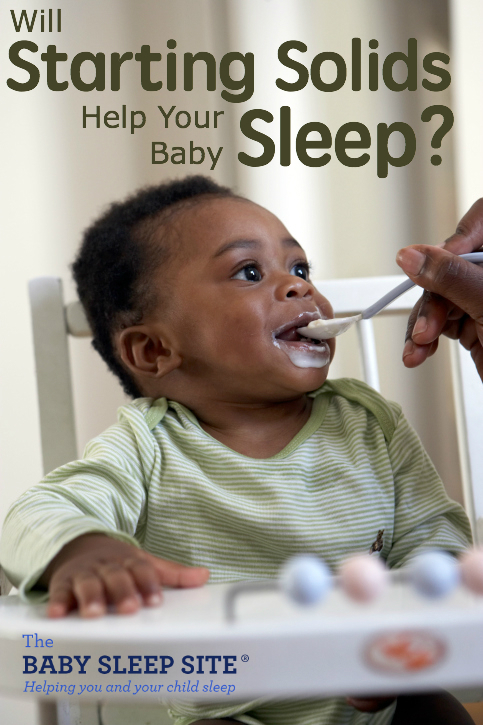 In fact, a 2010 study suggests that starting solids before the age of 4 months may actually disrupt sleeping! This study revealed that babies who began eating cereal before 4 months of age slept half an hour less each day than infants who weren’t eating cereal. Keep in mind that the recommended age for starting solids has changed in the past few years. Now, the American Academy of Pediatrics (along with many other health organizations) recommends starting solids closer to 6 months of age. Researchers have found that waiting to begin solids until 6 months protects babies from a whole host of complications, including illness, food allergies, iron deficiency, and future obesity. The logic behind the assumption that starting solids will improve sleep is easy to trace. It seems to make sense that offering your baby a big dish of rice cereal will fill her up and keep her full all night long. And if she’s full, she won’t wake up in the middle of the night crying, right? Perfect! Cereal = 10 straight hours of sleep. Problem solved. If only the equation for a good night’s sleep were as simple as that! It’s not, though. Not exactly. It’s true that hunger is one reason babies wake up during the night and cry. This is especially true for newborns, who need to eat at least every 3 hours. So if the only reason your baby is waking at night is because he’s hungry, then starting solids will likely help improve his sleep and get him sleeping for longer stretches at night. But (as any parent who’s cross-eyed with exhaustion can tell you) hunger isn’t the only reason a baby wakes at night — far from it. Many babies sleep poorly at night due to sleep associations, or perhaps because they’re experiencing a sleep regression. In these cases, hunger has nothing to do with a baby’s night waking. Keep in mind too that as babies grow, they need fewer and fewer nighttime feeds. By 4 months, most babies need 1-3 nighttime feedings; by 6 months, (the earliest age that experts recommend starting solids), that number drops to 1-2. Keep in mind, this is provided your baby is receiving all of their necessary daytime calories! So if your baby is waking frequently during the night, the problem probably isn’t hunger (or at least, it’s not just hunger). And that’s why there’s no actual link between feeding your baby solids and having him sleep better. If he isn’t sleeping well, it’s probably because he’s formed bad sleep habits, not because he’s constantly hungry. Picture it this way: imagine that you have a terrible cold, and your sniffling and sneezing wakes both you and your partner a few times every night. Now, imagine that after three or four sleepless nights, your partner proposes a solution — he (or she) thinks that if you’d just eat two helpings of everything at dinner, you’d be nice and full before bed, and that would surely help you sleep all night long. Wouldn’t work, would it? Because your problem isn’t hunger — it’s illness. You don’t need food — you need medicine or for your body to recover from your illness. As parents, our goal is to uncover our babies’ actual sleep problems and then offer the right solutions. The equation isn’t as simple as solids = sleep. Our babies are bound to throw in one or two (or three…or four…) variables that make the problem a whole lot harder to solve. Fortunately, you don’t have to solve it all by yourself! Let The Baby Sleep Site help do the math with you. 🙂 Your consultant will craft a Personalized Sleep Plan® that accounts for your child’s unique temperament and sleep challenges, as well as your parenting philosophy. Browse our sleep consulting packages here. Solids may not help your baby sleep – but we can! Friends and family keep telling me that I should switch to formula before bed, and then my baby will sleep through the night. Have you any advice about this “suggestion”? I feel like they all think I’m crazy for continuing to breastfeed. My baby is 8 1/2 months old. She’s waking at least 4 times a night, so I’m pretty sure it’s not just because she’s hungry. However she doesn’t drink much expressed milk during the day while I’m at work, so I don’t want to stop feeding her at night if she’s hungry. Our 9.5-month-old definitely sleeps better when he’s had a good evening meal, with plenty of protein and good fats. He’s been gaining slowly and is a VERY distracted daytime nurser, so I still nurse him twice at night if he wakes (till the pediatrician tells us he’s gaining enough). But when he’s eaten well (solids) during the day, he will often only wake once to nurse. So while I don’t think solids solve every sleep issue, I do think they can help if you have a genuinely hungry kiddo. So I spoke to my lactation consultant and she agreed to give it a try. So i started giving him very watery (milky) rice and things did improve a bit…. He went from 1/2 hr to about 2hrs… Which was still exhausting, but definitely better. @ Irene – I think the key thing as that you spoke to a lactation consultant first – that is a GREAT first step, and one that parents really should take if they’re offering solids before 5 months or so. Best to talk to a healthcare provider, and to make sure that the addition of solids doesn’t impact breastfeeding or formula feeding. @ Wee — thanks for sharing your story! In general, you’re absolutely right; a baby’s sleeping issues are usually more complicated than parents realize at first, and so a “quick fix” like offering solids doesn’t usually fix the problem. @ Domestic Diva & Hansini Fonseka — thanks to you as well for sharing your stories, especially since you both seem to be the exception to the “rule” that solids doesn’t fix poor sleeping! In your cases, it sounds like you had babies who were truly waking out of hunger and a need to eat. For most of the babies we work with, the problem isn’t quite so straightforward, but I’m glad it was in both your cases! And Domestic Diva, you offer a good reminder: when discussing feeding of any kind (whether breast, formula, or solids), it’s important to remember that if you have any concerns about your child’s nourishment (either because he seems to be losing weight, or because she’s not pooping well, etc. ), talk to a healthcare provider. Hi, my baby boy at 4 months started eating solids with a well reception and surprisingly now he can sleep over night. Earlier he used to get up for about 3-4 times for feedings but I started giving him solids at around 6 pm as advised by his doctor and the magic worked. So I consider myself blessed !! While most babies this article would be true for; I feel I must bring up an exception to be careful of with some babies. My son around 3 1/2 months hit a huge growth spurt & started losing weight and being very fussy & crying. We couldn’t figure out what it was. Then he started wanting to nurse ever 1- 1 1/2 hours which was draining me & I felt like I couldn’t keep up with this massive need for production. He wouldn’t sleep for naps or night time–he would only cry hysterically. So, we talked with our doctor. Now, our doctor has kids that were all breastfed. He was concerned about the weight loss…though not major weight loss, this is not a good trend for a new baby. My son also has never been a chubby baby (chubby babies aren’t bad but my son never was). He has been pretty lean from day one. After much deliberation we found out he has a high metabolism like I did as a baby/kid & our doctor suggested to start cereal. The very night we gave him cereal before bed & a small amount at every other feeding….he slept through every nap & through the night again (he had been sleeping through the night since 2 months & we didn’t know what was wrong until then). Still today, this now 1 year old eats tons of food & is still lean and getting tall. Most nights he still need cereal before bed to sleep through the whole night or he wakes up asking for food (he signs & knows some words now). This probably won’t be most mom’s case but if your kid is leaner than most & very demanding of your breasts….I would look into that as a solution. I won’t try giving cereal right away with the next baby on the way unless he/she shows the same tendencies. Every kid you have is different so you need to pay attention to what they need. Just because my firstborn son needed cereal at 3.5 months doesn’t mean my next one or the one after that will need it too. I just want people to think about all the possibilities. I wouldn’t have even thought about him being hungry until we saw a two week consistent weight loss. Just know what is normal & isn’t. Most cases kids at age 3-4 months have some changes in their brain/sleep habits & in other areas sometimes too. We followed the advice that our son didn’t need cereal & it didn’t solve the problem but I’ve seen what this article is saying be true for other babies. Again, know your own child & pay attention to details so you can make the best possible decision. Even now, I can tell when my son is crying for me for a really good reason & if its just whining–you get to know what makes them “tick” and their actions, personality & reactions to things. Just trust your instinct and mingle in some sound advice when you aren’t sure what to do. I thoroughly agree that solids will not help unless it is a hunger issue and even if it is, at 4 months, I will still not offer cereal because it could just backfire and cause more sleep issues with indigestion and tummy aches. My daughter was a very poor sleeper at night when she was a baby. I had suggestions that my milk was insufficient (despite a phenomonal amount of poop and and tripling of weight in 4 months) and was told to give her formula. (not by the ped, who thinks she was growing beautifully). Well, it just turned out that she was irritable at night because of 1) dairy in my diet, 2) heat rashes, 3) and indigestion from over eating. AND she was a low average sleep requirement baby. So, the sleep problem was waaayyyy more complicated than just hunger. @ Sarah — how interesting that you were part of a medical study! What were the results (if you don’t mind my asking 😉 )? Good insight about it going “around and around in a circle” — isn’t that the truth! Thanks for sharing your experience, Sarah! I was on a study (looking at allergies & whether the 6 month milk feeding rule is correct) so I breastfed my LO to 6 months. She had a 4 month sleep regression (previously sleeping 4 hrs, quick dreamfeed then 8 hours) and EVERYONE kept telling me she was hungry – no matter we had 4 colds between 4 months and 6 months which I think caused a lot of the problems. Anyhow, when we finally started solids at 6 months, her poor digestion system didn’t know what had hit it, we had awful wind / poo problems for the first week as her tummy got used to something other than breastmilk. So we slept less, not more! However after all that, we now (11 months) find that she sleeps longer on days she has had a decent evening meal and following milk feed. Not every day, but a poor meal usually means poor sleep. Of course sometimes a poor evening meal is caused by poor napping / teeth /over tiredness… it all goes around and around in a circle. I just take a deep breath and start every day new! @ Molly — Well, at least you know you’re not alone in having a mom who preaches the “gospel of solids” 😉 I think everyone’s mom/grandma/aunt has offered that advice at one point or another, in spite of research that directly contradicts it! And good point about your doctor’s theory — imagine how Gerber’s profits would soar if they could print that on their boxes of cereal! @ PO — Glad you found the article interesting! With regards to your question, I think the first thing to keep in mind is that at 4 months, it’s still considered very normal for a baby to eat once (or even two or three times) during the night. So I’d say there’s nothing “abnormal” about your daughter needing one nighttime feed. Interesting article, thanks for sharing your stories Nicole! I have a 4 month old that is waking up once a night and taking a full feeding and then going right back to sleep. This has been going on for the past few weeks. It is frustrating because prior to this, she was doing 12 hour stretches with no feeding required! I’ve tried everything from cluster feeding to increasing the amount at each feed, even giving her a “dream feed”; recently I started adding a small amount of rice cereal (1 tsp) to her bottle – not noticing any difference(by the way, the revised guidelines, at least here in Canada, are to start solids between 4-6 months as opposed to 6 months – they keep going back and forth on this). Any thoughts why at 2.5 months she could sleep a 12 hrs in a row and now at 4 months can only do a 9-10hr stretch before getting hungry?